"Why should I let myself be used for the profits of others?" 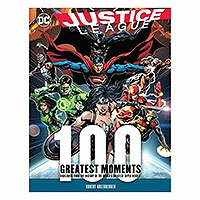 The chronological adventures of Booster Gold have been depicted exclusively in comic book form, however the character has escaped the 4-color pages of comic books to appear in a variety of other media. Surely this would make Booster quite proud. 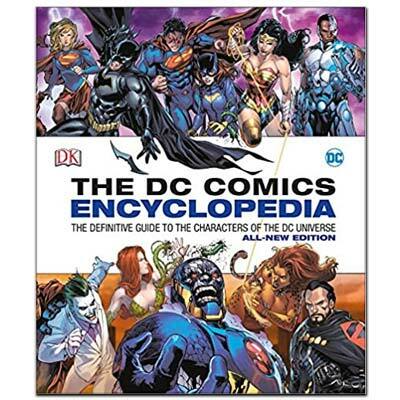 The DC Comics Encyclopedia was published in 2004 by DK Publishing as a "definitive" collection of the characters populating the DC Universe. 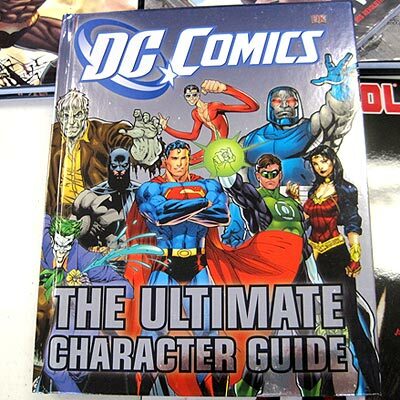 Booster Gold receives his own entry in the Encyclopedia (on page 52), providing a very brief overview of the character, his powers, and his history. 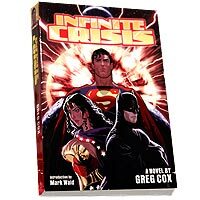 An "Updated and Expanded" version of the encyclopedia was published in 2008, updating the biography (on page 58) to remove references to the Super Buddies and include the events of Infinite Crisis and 52. 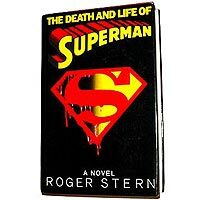 Both entries are credited to writer Robert Greenberger. 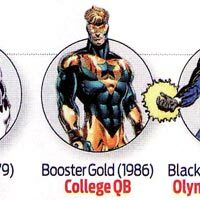 Booster Gold also appears in entries for Extreme Justice and the Justice League International that are practically identical in both volumes. Skeets receives his own entry in volume 2 (page 311). 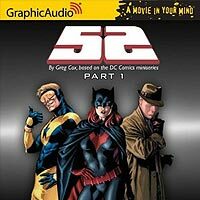 The comic book events of the maxi-series 52 have been adapted by Greg Cox into an English-language cd-format audiobook released by GraphicAudio. 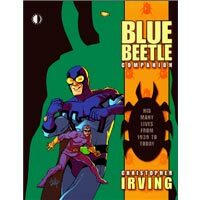 The series is divided into two separate audiobooks, each approximately 6 hours long. 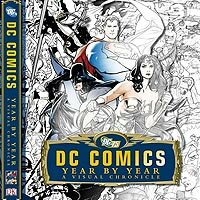 David Coyne reads the part of Booster Gold (and Daniel Carter! ); Ken Jackson is Skeets. 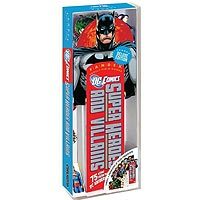 The DC Comics Superheroes and Villains Fandex Deluxe by Workman Publishing Company is an encyclopedia of DC Comics characters. However, instead of biographical entries printed on standard pages, the Fandex uses cards cut into the shapes of the characters represented. 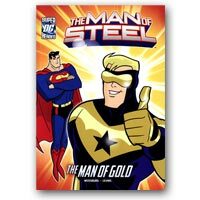 Booster Gold has his own card in the Fandex written by Randall Lotowycz. 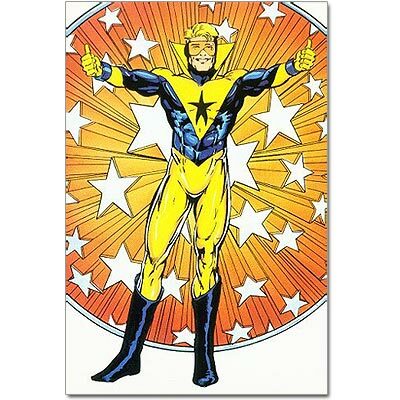 Bosoter's card uses a drawing of the character by Dan Jurgens and Norm Rapmund originally appearing on the cover of Booster Gold, Volume 2, issue #18. 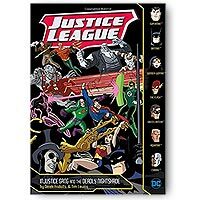 In 2017, Capstone Publishers imprint Stone Arch Books released a series of illustrated children's books starring the Justice League Unlimited. 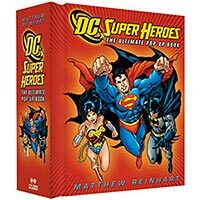 These books include illustrations by artist Tim Levins, and each features a "roll call" of Justice League members. 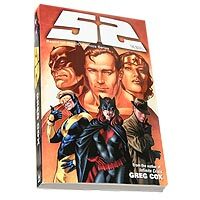 Among the roster in each book is our hero, Booster Gold. 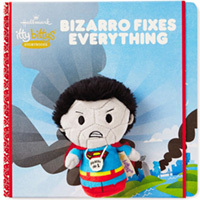 Booster Gold makes a cameo appearance in Bizarro Fixes Everything, a 20-page hardcover from Hallmark itty bittys storybooks line for children. The book is accompanied by a 4-inch Bizarro doll. 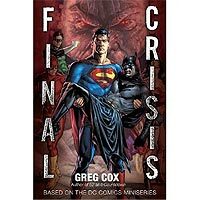 Written by Alex Boney with Art by Steve Willaredt.